San Francisco private investigator Jake Diamond is known for his stained neckties and stash of sour-mash whiskey; but Jake is more likely to be toting a worn paperback Classic novel than a handgun. More over-easy than hard-boiled, Diamond can be beaten up and knocked around without taking it too personally; but when his friends and loved ones are threatened, it’s a different story. When a Chicago thug known as Ralph Battle bursts into the office of Diamond Investigation waving a 44 magnum at Diamond and his trusty assistant, Jake has the distinct feeling that missing his lunch of fried calamari may not be the worst of his problems. Jake accompanies Battle to Chicago at the mandatory request of Max Lansdale, a mob-connected attorney, who asks Jake to search for a pair of ghosts and will not take no for an answer. Pushed to the edge, Jake is ready to put his rusty .38 to use to get Lansdale off his back. 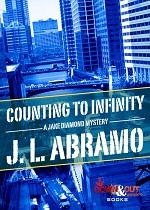 Running between San Francisco, Chicago and Los Angeles, Diamond tries to stay one step ahead of the man who will have Jake killed with no remorse as soon as Diamond proves useless. With the help of Joey Russo and a team of Jake’s familiar cohorts, including Vinnie “Strings” Stradivarius, Darlene Roman and Sonny “The Chin” Badalamenti, Jake may be saved from becoming a murderer himself. May be. Trying to escape the wildest ride of his life; Jake is counting on luck, counting on a group of unlikely heroes, and counting to infinity. “San Francisco private investigator Jake Diamond is forcibly persuaded to meet Max Lansdale for a job he can’t refuse. Max wants Jake to find Harry Chandler who was reported dead in a shoot-out. Max says that a private investigator reported to him that he ran into Harry. The reason Jake is chosen for the job is that his mentor and associate Jimmy Pigeon reported that Harrison died. Max believes that the mantle has passed to Jake. Max wants to find Chandler because he killed Max’s brother Randolph. When Jake returns to San Francisco his trusty associate Darlene tells him that Max is connected to the mob. Jake buys time to figure out how to handle the situation because Max has threatened Darlene and his ex-wife and lover if he doesn’t get results. When he finally meets with Chandler, an unknown person kills Harry. Soon after a bomb goes off in Jake’s apartment, killing Sally and injuring Jake. When he recovers Jake and his friends put into motion a plan to bring Max down.